Okay, so technically I didn’t “stir fry” anything here, but this is what you make at home to mimmic stir fry when you don’t have the proper equipment. This was really more of a “brief sauté”, but that just doesn’t have the same ring to it. 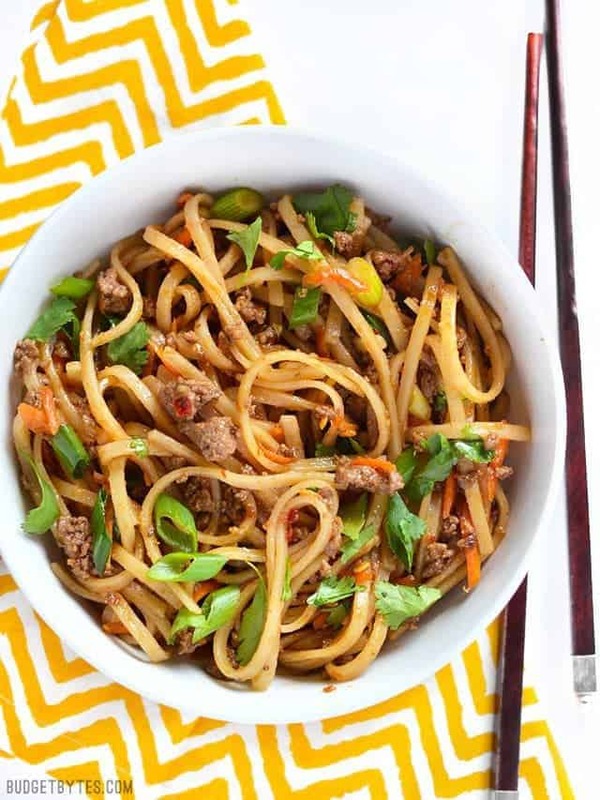 Regardless, these Stir Fry Beef Noodles were fast and delicious, and that’s what really counts, right? I made this dish as simple and fast as possible, which was my goal. No frills, just good and easy. The ingredients are basic, but the flavor is still big. I used carrots and green onions as my only vegetables, but you could always toss in a handful or two of broccoli slaw, thinly sliced bell peppers, snow peas, bean sprouts, or really just about any vegetable that floats your boat. We’re going for fast, filling, and convenient with this one! Sweep out that fridge and make it work. I used rice noodles for this because that’s what I was in the mood for, but in a pinch you could probably use just about any long pasta that you’d like. Ramen? Okay, go for it. Fettuccini? It’ll pass. 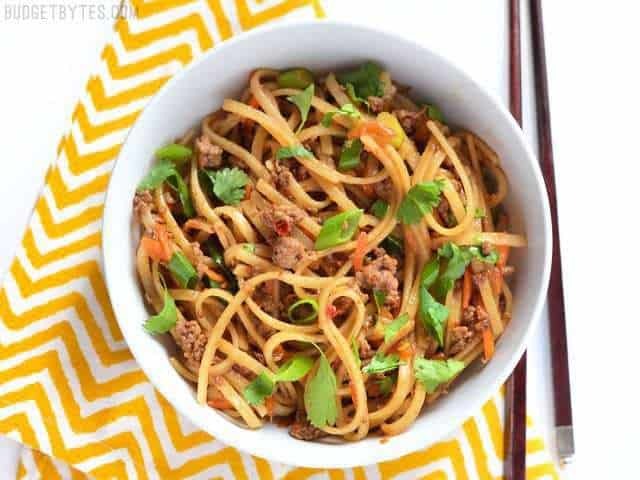 Lo mein? Do it. Flexibility is the name of the game when it comes to stir fry! 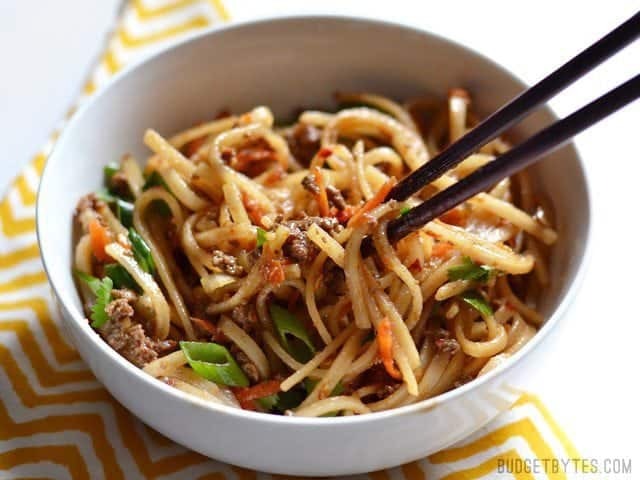 These everyday fast stir fry beef noodles are easy enough to make on a busy weeknight and delicious enough to keep you from calling for take-out. 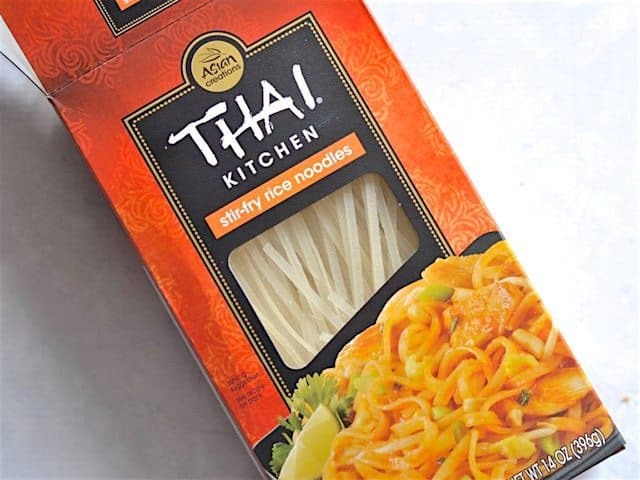 Cook the noodles according to the package directions, being careful to leave them al dente and not over cooked. 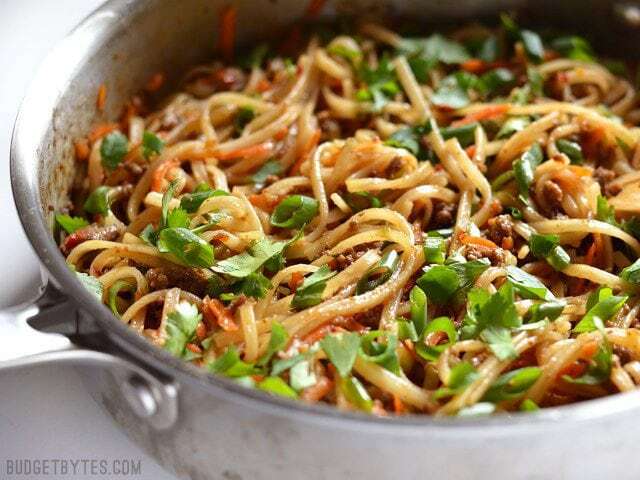 drain the noodles in a colander and set aside. 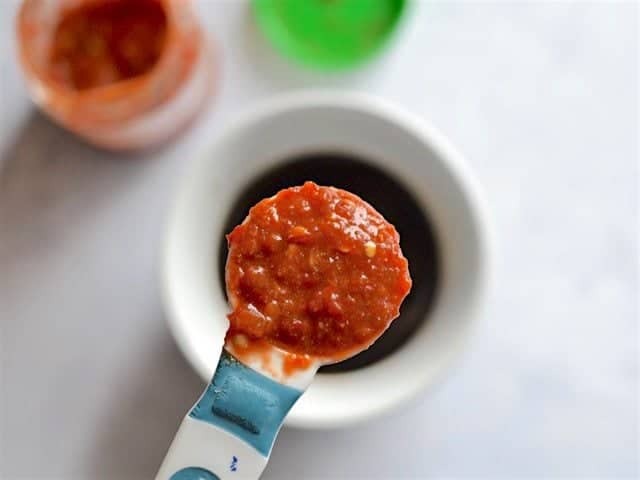 Prepare the sauce by stirring together the soy sauce, water, brown sugar, chili garlic sauce, and sesame oil. Set the sauce aside. 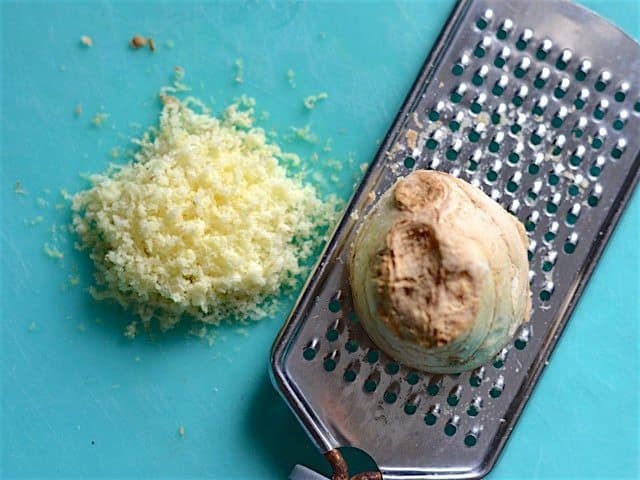 Mince the garlic and grate the ginger. Use a large-holed cheese grater to grate the carrot (or julienne using a mandoline). 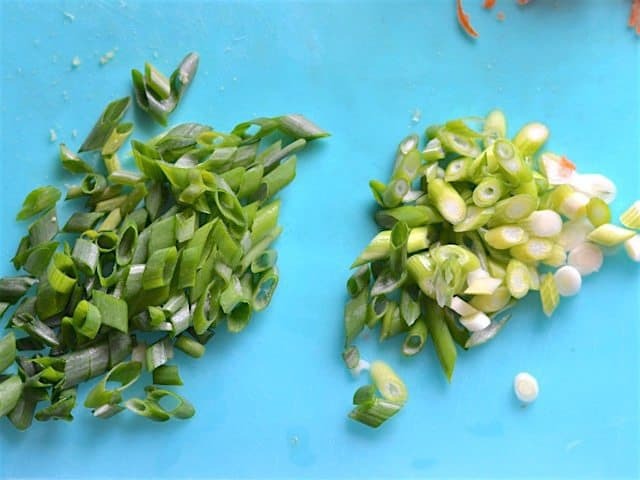 Slice the green onions on a diagonal, separating the fleshy white portions from the green ends. Heat the vegetable oil in a large skillet over medium heat. 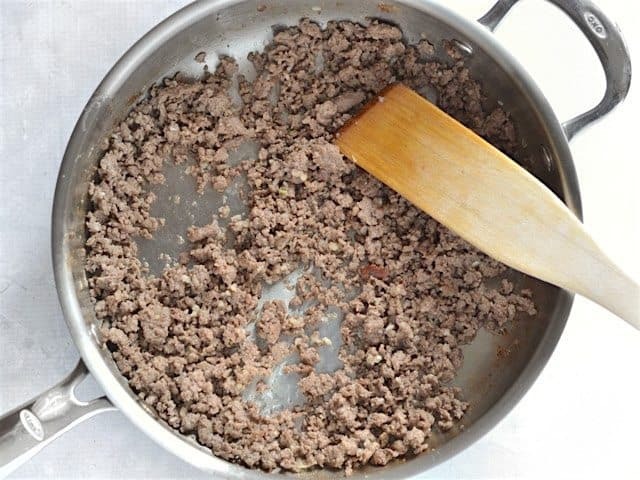 Once hot, add the ground beef, garlic, and ginger. Sauté until the beef is cooked through. Add the white portions of the sliced green onions and sauté for one more minute. Add the shredded carrots and sauté for one minute more (leaving the carrots slightly crunchy). 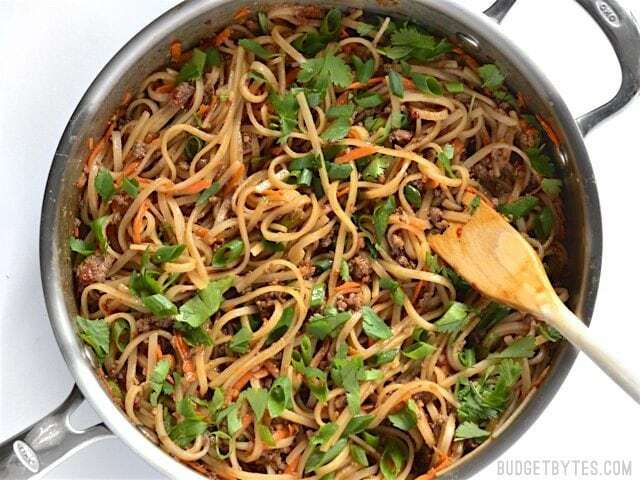 Add the drained noodles and the prepared sauce to the skillet. 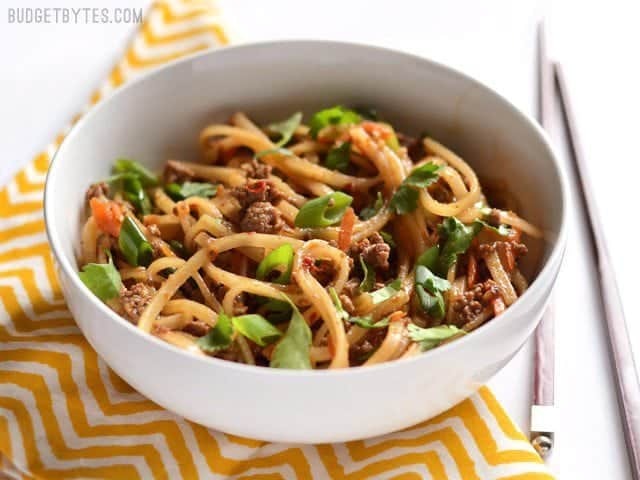 Stir until everything is coated in sauce and any extra moisture has been absorbed by the noodles. Turn the heat off and top with the green portion of the sliced green onions and fresh cilantro leaves. While the noodles are cooking, prepare the stir fry sauce. This is a super basic, pared down sauce. Stir together 3 Tbsp soy sauce, 1 Tbsp water, 1 Tbsp brown sugar, 1-2 Tbsp chili garlic sauce (depending on how spicy you like it–I used 2 Tbsp), and 1 tsp sesame oil. I love using chili garlic sauce in my stir fry because it’s like killing three birds with one stone. 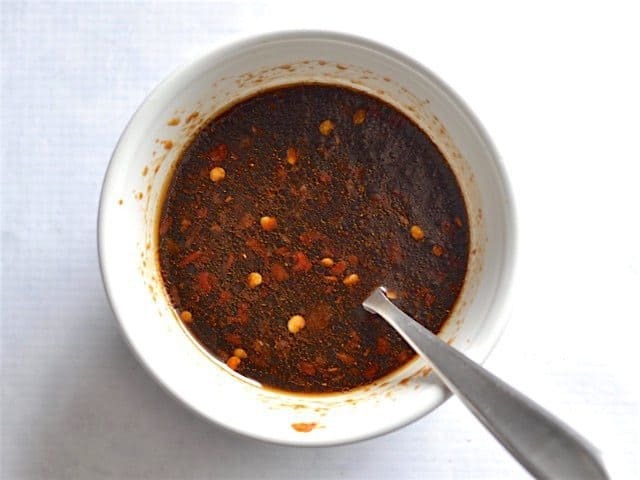 This rustic sauce contains red pepper, garlic, and vinegar, three ingredients that I’d normally add to a stir fry sauce separately (this particular sauce is made by Huy Fong, makers of the most popular sriracha). You can also use sambal oelek or sriracha in place of this sauce. 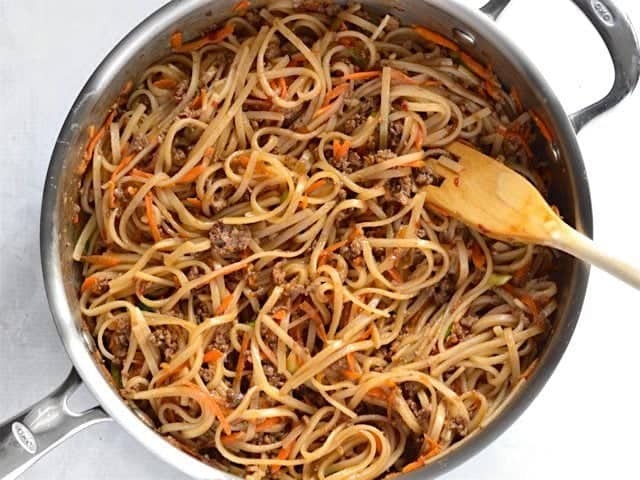 You can also prepare the rest of the ingredients while the noodles cook, so that everything is ready to toss together quickly in the skillet. Grate about one inch of fresh ginger (about 1 Tbsp). I keep my ginger in the freezer, which makes it really easy to grate. Also mince two cloves of garlic. 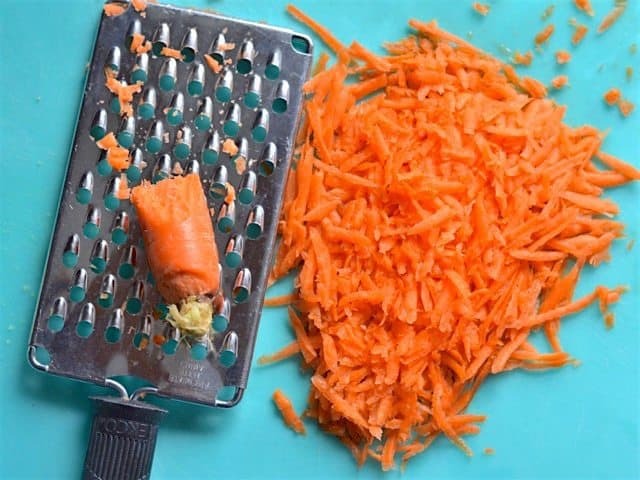 Use a large hole grater to grate one carrot. If you don’t have a grater, you can use a spiralizer, mandoline, or a julienne peeler. Slice 3-4 green onions, separating the white/fleshy ends from the green ends (they’ll be added to the stir fry at different times). Finally, heat 1 Tbsp vegetable oil in a large skillet over medium heat. Once hot, add 1/2 lb. 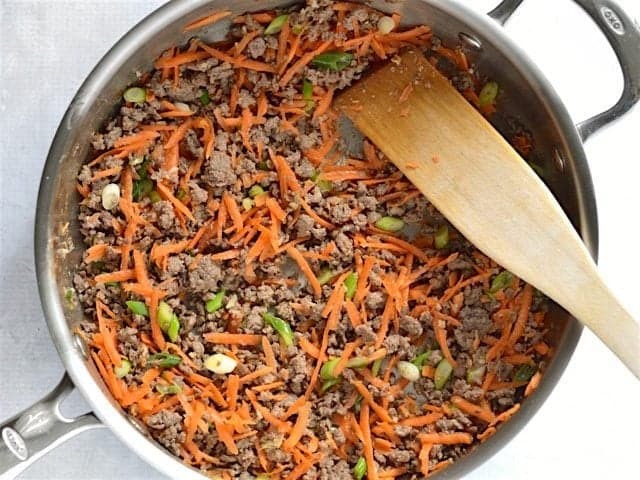 lean ground beef, the minced garlic, and grated ginger. Sauté until the beef is cooked through. Add the white ends of the sliced green onions and sauté for one minute more. Add the shredded carrots and sauté for one additional minute. I added the carrots last because I wanted them to stay fairly crunchy. Finally, add the drained noodles and prepared sauce. 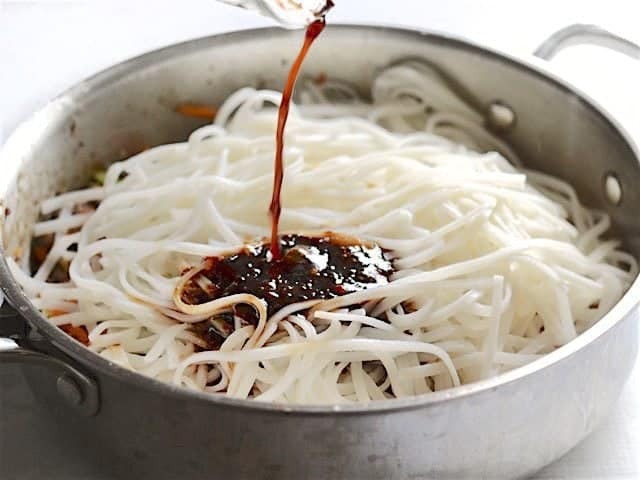 Stir until everything is coated in sauce and no extra liquid remains on the bottom of the skillet (it should get absorbed by the noodles). Turn the heat off. Top with the remaining green portions of the sliced green onions and a handful of fresh cilantro leaves (optional). So super delicious! I ate it for lunch 4 days in a row and looked forward to it every day. And on Wednesday, my coworkers were all jealous of my lunch. Hi I am just wondering whether this meal would be able to be frozen and reheated for quick lunches/dinners? This one probably won’t be as good for freezing because it’s not quite saucy enough to keep it from drying out. I find that pasta dishes need a lot of sauce to survive the freeze/thaw cycle. So normally, what Beth calls 4 servings is 2 servings for me and my wife. Had a pound of beef in the refrigerator that I needed to use up. So doubled everything, figuring we could have the left overs tomorrow night. So made it, eating it….and OMG, it is so good I can’t stop eating. Had to go back and get more! Even my wife who almost never over eats went back for seconds. So what I had been planning for our meal tomorrow night for both of us is now just a small snack for just me. Haha, story of my life. :) So glad you enjoyed it, Joshua! !